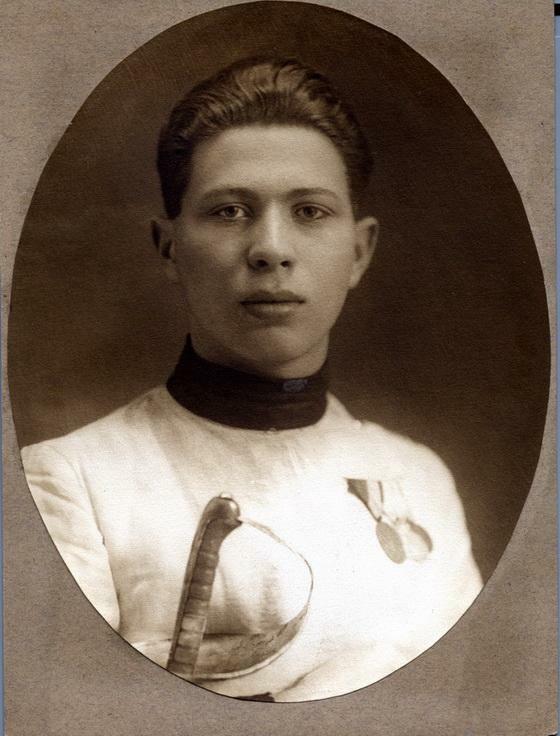 Attila Petschauer competed at the 1928 and 1932 Olympics, winning team sabre gold both years and an individual sabre silver in 1928. At the European Championships, Petschauer won silver medals individually in 1925 and 1929, and bronze medals in 1923, 1927, and 1930. He also helped Hungary win team sabre European titles in 1930-31. In World War II most Hungarian Jews were deported to concentration camps, but Petschauer’s status as an elite sportsman exempted him initially. But in 1943 he was deported to the Davidovka concentration camp in the Ukraine. During a prisoner line-up Petschauer was called out by the commanding officer of the camp, Lt. Col. Kálmán Cseh von Szent-Katolna, who had competed in equestrian for Hungary at the 1928 Olympics. It was mid-winter and bitter cold, but the guards forced Petschauer to undress and climb a tree, and while up there, they sprayed him with freezing water. He died shortly thereafter. Petschauer’s story was told in the 1999 film “Sunshine,” starring Ralph Fiennes.